The fourth Independence (CV-22), begun as Amsterdam (CL-59), was launchedas CV-22 on 22 August 1942 by New York Shipbuilding Corp., Camden. N.J.;sponsored by Mrs. Rawleigh Warner; and commissioned 14 January 1943, CaptainG. R~ Fairlamb, Jr., in command. The first of a new class of carriers converted from cruiser hulls, Independence conducted shakedown training in the Caribbean. She then steamed throughthe Panama Canal to join the Pacific Fleet, arriving San Francisco 3 July1943. Independence got underway for Pearl Harbor 14 July, and after 2 weeksof vital training exercises sailed with carriers Essex and Yorktown fora devastating raid on Marcus Island. Planes from the carrier force struck 1 September and destroyed over 70 percent of the installations on the island.The carrier began her next operation, a similar strike against Wake Island5 to 6 October, as CVL-22. redesignated 15 July 1943. Independence sailed from Pearl Harbor for Espiritu Santo 21 October;and, during an ensuing carrier attack on Rabaul 11 November, the ship'sgunners scored their first success-six Japanese planes shot down. Afterthis operation the carrier refueled at Espiritu Santo and headed for theGilberts and prelanding strikes on Tarawa 18 to 20 November 1943. Duringa Japanese counterattack 20 November, Independence was attacked by a groupof planes low on the water. Six were shot down but the planes managed tolaunch at least five torpedoes one of which scored a hit on the carrier'sstarboard quarter. Seriously damaged, the ship steamed to Funafuti 23 Novemberfor repairs. With the Gilberts operation, first step on the mid-Pacificroad to Japan, underway, Independence returned to San Francisco 2 January1944 for more permanent repairs. The veteran carrier returned to Pearl Harbor 3 July 1944. During herrepair period the ship had been fitted with an additional catapult; andupon her arrival in Hawaiian waters, Independence began training for night carrier operations. She continued this pioneering work 24 to 29 August outof Eniwetok. The ship sailed with a large task group 29 August to take partin the Palaus operation, aimed at securing bases for the final assault onthe Philippines in October. Independence provided night reconnaissance andnight combat air patrol for Task Force 38 during this operation. In September the fast carrier task force regularly pounded the Philippinesin preparation for the invasion. When no Japanese counterattacks developedin this period, Independence shifted to regular daytime operations strikingtargets on Luzon. After replenishment at Ulithi in early October, the greatforce sortied a October for Okinawa. In the days that followed the carriersstruck Okinawa, Formosa, and Philippines in a striking demonstration ofthe mobility and balance of the fleet. Japanese air counterattacks were repulsed, with Independence providing day strike groups in addition to nightfighters and reconnaissance aircraft for defensive protection. As the carrier groups steamed east of the Philippines 23 October, it became apparent, as Admiral Carney later recalled, that "somethingon a grand scale was underfoot." And indeed it was, as the Japanesefleet moved on a three pronged effort to turn back the American beachhead on Leyte Gulf. Planes from Independence's Task Group 38.2, under Rear AdmiralBogan, spotted Kurita's striking force in the Sibuyan Sea 24 October andthe carriers launched a series of attacks. Planes from Independence andother ships sank giant battleship Musashi and disabled a cruiser. That evening Admiral Halsey made his fateful decision to turn Task Force38 northward in search of Admiral Ozawa's carrier group. Independence's night search planes made contact and shadowed the Japanese ships until dawn 25 October, when the carriers launched a massive attack. In this secondpart oi the great Battle for Leyte Gulf, all four Japanese carriers weresunk Meanwhile American heavy ships had won a great victory in Suriago Strait; and a light carrier force had outfought the remainder of Rurita's shipsin the Battle Off Samar. After the great battle, which virtually spelledthe end of the Japanese Navy as a mayor threat, Independence continued toprovide search planes and night fighter protection for Task Force 38 instrikes on the Philippines. In these operations the ship had contributedto a major development in carrier group operations. Independence returned to Ulithi for long-delayed rest and replenishment 9 to 14 November, but soon got underway to operate off the Philippines onnight attacks and defensive operations. This phase continued until 30 December1944, when the great task force sortied from Ulithi once more and movednorthward. 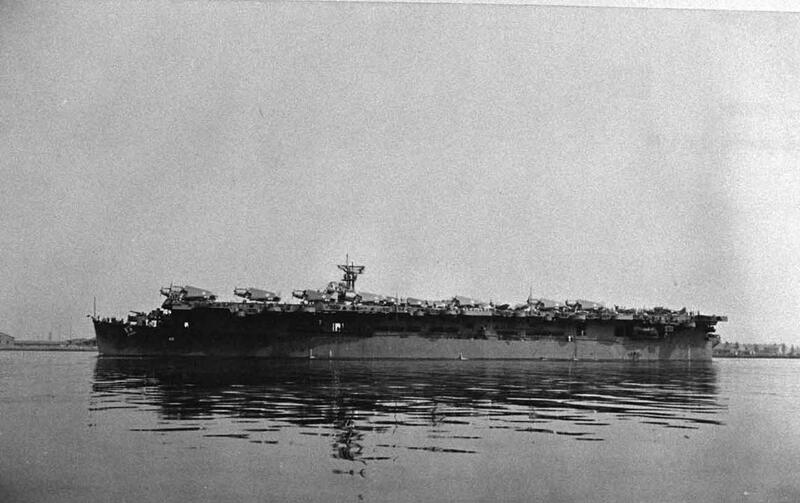 From 3 to 9 January the carriers supported the Lingayen landingson Luzon, after which Halsey took his fleet on a daring foray into the SouthChina Sea. In the days that followed the aircraft struck at airbases on Formosa and on the coasts of Indo China and China. These operationsin support of the Philippines campaign marked the end of the carrier's night operations, and she sailed 30 January 1945 for repairs at Pearl Harbor. Independence returned to Ulithi 13 March 1945 and got underway next dayfor operations against Okinawa, last target in the Pacific before Japanitself. She carried out preinvasion strikes 30 to 31 March, and after theassault 1 April remained off the island supplying Combat Air Patrol andstrike aircraft. Her planes shot down numerous enemy planes during the desperate Japanese attacks on the invasion force. Independence remained off Okinawa until 10 June when she sailed for Leyte. During July and August the carrier took part in the final carrier strikesagainst Japan itself, attacks which lowered enemy morale and had much todo with the eventual surrender. After the end of the war 15 August, Independenceaircraft continued surveillance flights over the mainland locating prisoner of war camps, and covered the landings of Allied occupation troops. Theship departed Tokyo 22 September 1945, arriving San Francisco via Saipanand Guam 31 October. Independence joined the "Magic-Carpet" fleet beginning 15 November1945, transporting veterans back to the United States until arriving SanFrancisco once more 28 January 1946. Assigned as a target vessel for theBikini atomic bomb tests, she was placed within one-half mile of ground zero for the 1 July explosion. The veteran ship did not sink, however, andafter taking part in another explosion 25 July was taken to Kwajalein and decommissioned 28 August 1946. The highly radioactive hulk was later takento Pearl Harbor and San Francisco for further tests, and was finally sunkin weapons tests off the coast of California 29 January l951. Independence received eight battle stars for World War II service.